It’s quite a smart-looking venue, set slightly below street level in a row of venues that also includes Planet Pizza and Bar Humbug. While the front of the restaurant is laid out more for casual drinkers, the back room features tables set for diners, with a choice of sofa-style seats or wooden chairs, all in shades of brown and beige. The evening menu at Picture House East is a real mix. A tapas menu offers a deal of £11.50 per head (2 or more diners), which gets you bread, olives and four other dishes of your choice from the tapas menu. Don’t expect your ‘standard’ tapas, though: you’ll find that the menu includes the likes of Chew Valley smoked salmon with smoked salmon mousse and pea shoots (£5.50), and Toulouse sausage with braised Puy lentils (£5.90). The a la carte menu features dishes that are mainly British in origin (pan fried trout with fennel, roast Gressingham duck breast with lentils…), ranging from £10-£20 for a main course. 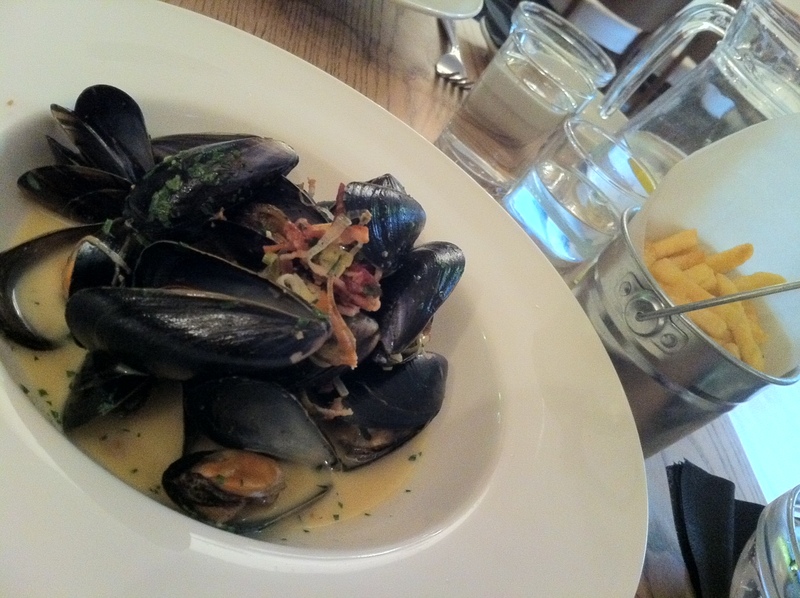 And some of the dishes are also carried through to the set menu, which we dined from that evening. A very smiley waiter took our drinks order, and came back shortly afterwards to carry our food orders through to the kitchen. We were served by three different members of staff on the night, all of whom seemed to be dividing their time between the bar and the dining room, but service was friendly and efficient. Our meals arrived within a decent space of time after ordering. For my friend, the grilled sardines with a Provencale sauce to start. Served on a slice of grilled bread, the fish were accompanied by a generous portion of spiced sauce, packed with Mediterranean herbs and vegetables. 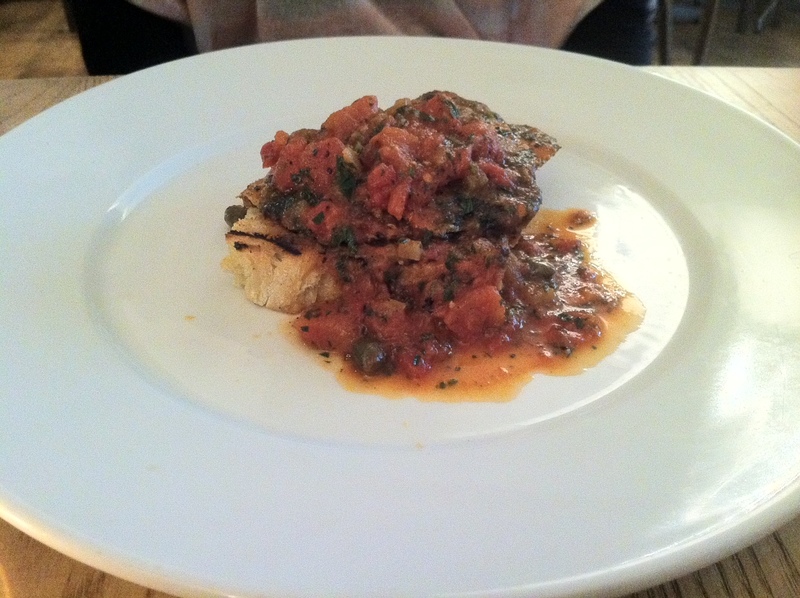 An enjoyable sauce, said my friend, but she struggled a little to extricate the fish bones. 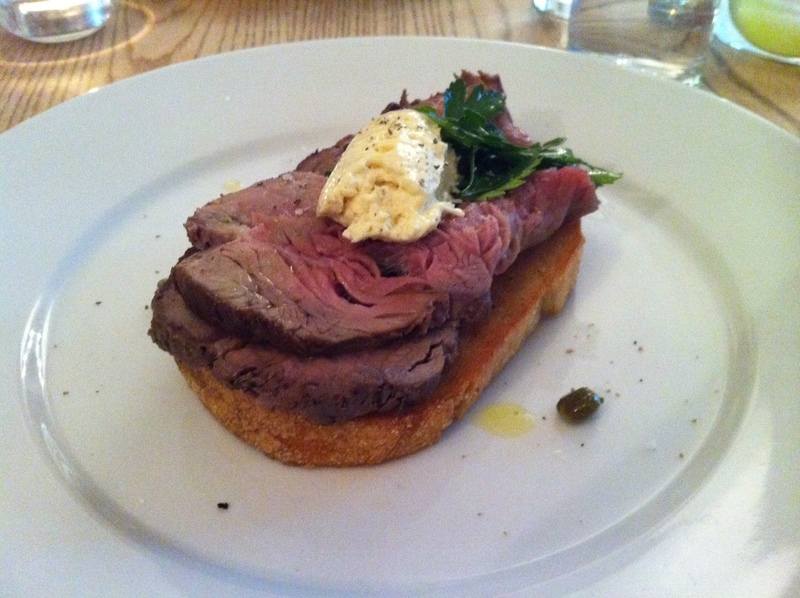 For me, a £2.50 supplement (marked as £3.50 on the bill…naughty, but we noticed) for the ‘rare roast beef on hot dripping toast, caper and parsley salad, horseradish cream’. A generous portion, with two thick slices of beef on top of a beautifully moist but not greasy slab of toast. The horseradish cream was wonderfully pungent, but it was a bit deceptive to call a few capers scattered on the plate and a couple of parsley leaves a ‘salad’.